U2 fans take note! If you want to experience a spectacular U2 concert, be a spectacular audience. Last night (Nov. 28), U2 rewarded the Montreal audience for its enthusiasm (wow, those people are loud!) and embrace of the band with a special concert. 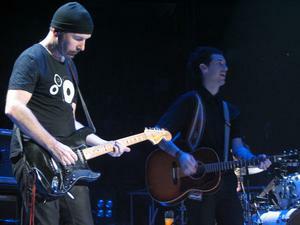 Following “With or Without You,” U2 invited opening band Arcade Fire to join them on stage to perform Joy Division’s “Love Will Tear Us Apart.” Songs that have been retired for a little while returned (“All Because of You,” “Miracle Drug”). Larry Mullen addressed the audience when a “technical error” occurred at the beginning of “All Because of You,” causing Bono to comment that he couldn’t remember Larry ever doing that before. Near the end of the concert, Bono provided a sincere declaration of the band’s love for the city, which was received with much enthusiasm. Photos ©Ruth Barohn/U2log.com. Please do not use without permission. Well isn’t that great… about the second Montreal show, that is. I had the pleasure of attending the first night in Montreal and absolutely loved it. However, the crowd was absolutely wild and the band equally pumped about it on the first night as well. Did they reward the first night’s crowd??? Noooooooo sir, they did not. Don’t get me wrong here, they put on a fantastic show but in actuallity, they gave the first night’s fans the “proverbial shaft” by playing less rare songs (I Will Follow instead of Electric Co., An Cat Dubh, etc), less HTDAAB tunes and only 20 songs in total. In case you haven’t been tracking, they play 21 on a good night. On Montreal night two, they played 22 songs. Ouch! Anyway, I love U2 but it seems a bit silly to reward only the second night for Montreal’s enthusiasm. Sorry Mark but in case you hadn’t noticed U2 have done this for their entire career. First night shows always pale in comparison to the 2nd nights. If you want to increase your chances of seeing the amazing shows don’t even bother with the 1st nights! 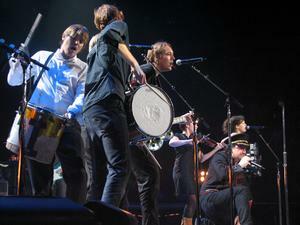 Would love to hear a recording of U2 and Arcade Fire covering Love Will Tear Us Apart. Anyone? That last photo of Edge is him staring at the ground following along either a chord chart or trying not to screw up what seemed to be simple chord progression. 🙂 I was watching him and he looked like how I’ve felt when someone springs a song on me to play that I haven’t practiced for. haha. Still fun to see/hear. Amazing show. I just keep repeating that to everyone who asks. But Mark, we got like an 8 minute brilliant version of Bad with Daniel Lanois on the first night. That counts for at least 2 songs. Montreal 1 was more brilliant than any of the 11 other U2 shows I’ve ever been to. It sounds like Montreal 2 was fantastic too — but I’m just happy I saw #1. Anyway, I’d rather have one awesome Bad than all the All Because of Yous in the world. I just can’t wait for the audio. I found a video of it. It’s 66MB but it is well worth it. They played 21 songs on the first night; not 20. And they did comment on how great a crowd we were; Bono kept saying “Wow”, and “you guys are crazy!” – referring to how loud and appreciative we were. Not to mention his comment that U2 were coming to live in Montreal; whether it’s true or not. This was the greatest show I’ve ever seen!